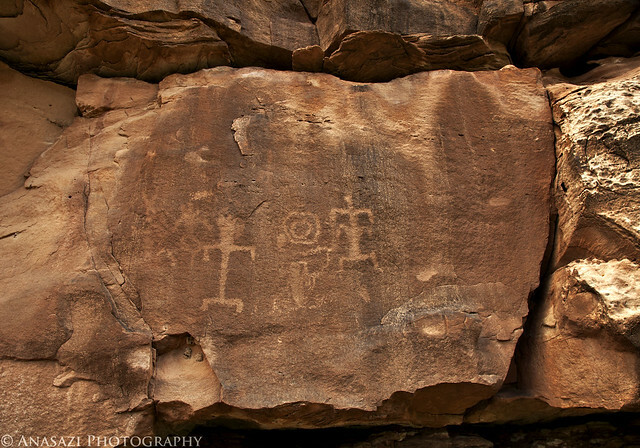 Another weekend on my own, so I decided to spend some time really exploring Montezuma Canyon for rock art and ruins. I have driven through the canyon before, but that was during a rainstorm in 2008 and I missed a lot on that trip. This time I started at the south end near the old Hatch Trading Post and ended up going about 15-20 miles up the canyon before turning back around. 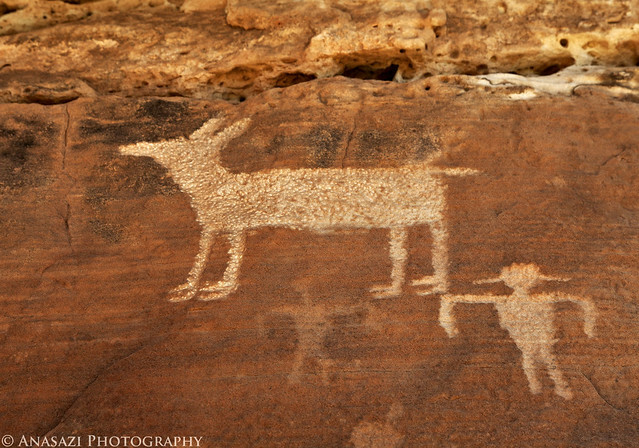 I only knew the locations of a few rock art panels and ruins, but I managed to find quite a lot on my own. I’m sure I missed many others, so I know I’ll be heading back there again in the future. 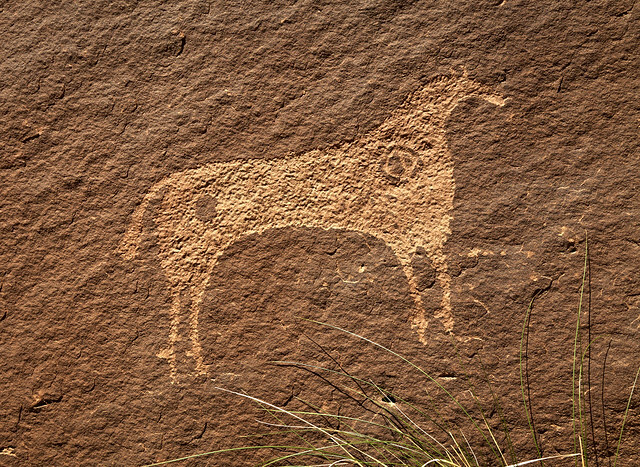 The first of a few horse petroglyphs I would find in the canyon. This one seems to be emerging from the crack in the wall. 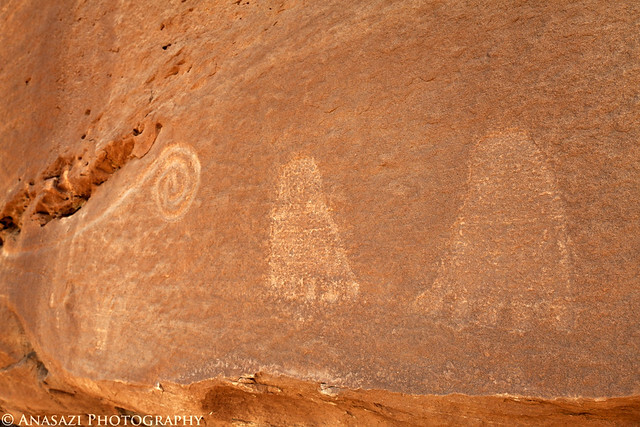 I managed to spot these faint concentric circles high up on a cliff from the road and then hiked over to investigate. 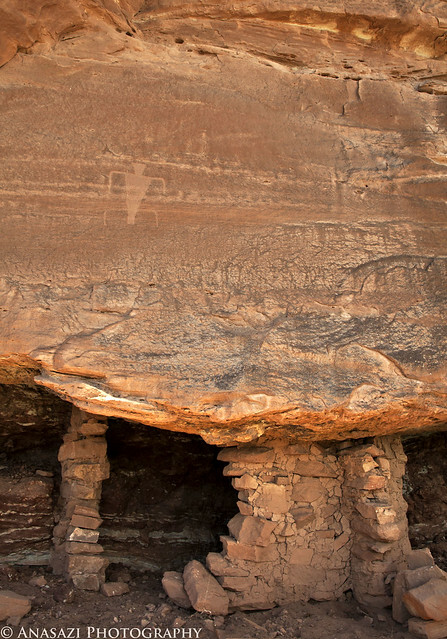 I spotted this panel tucked under an overhang high above and climbed up to find a pretty impressive and well preserved panel. What looks like a coyote as part of the same panel above. 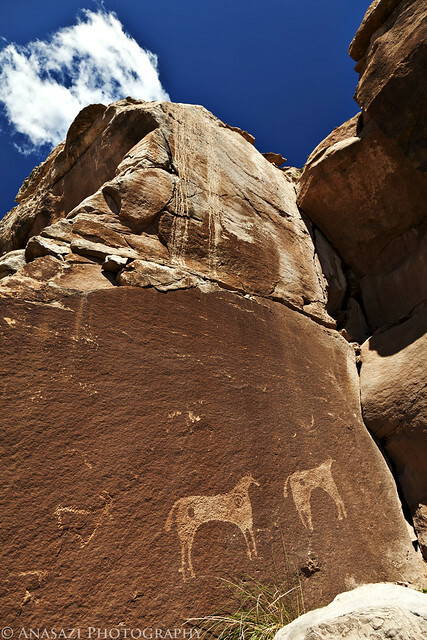 I found these two horses on a ledge below the panel posted above. 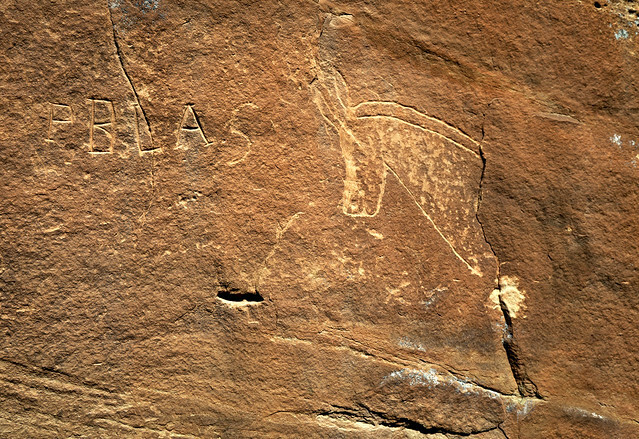 A closer look at one of the above horses. 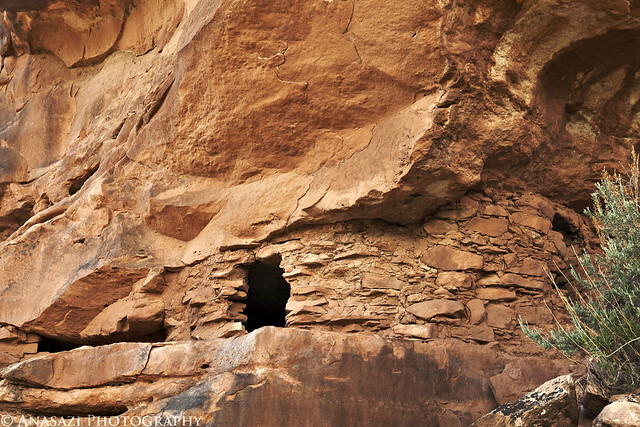 Here’s a small ruin with an anthropomorphic petroglyph above. 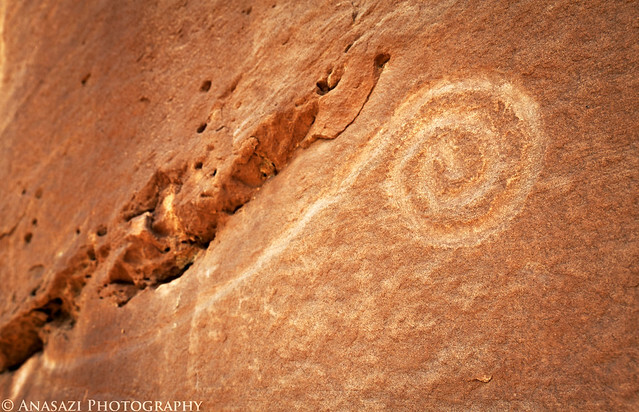 These feet and spiral were located nearby. I spotted these high above up a very steep talus slope. 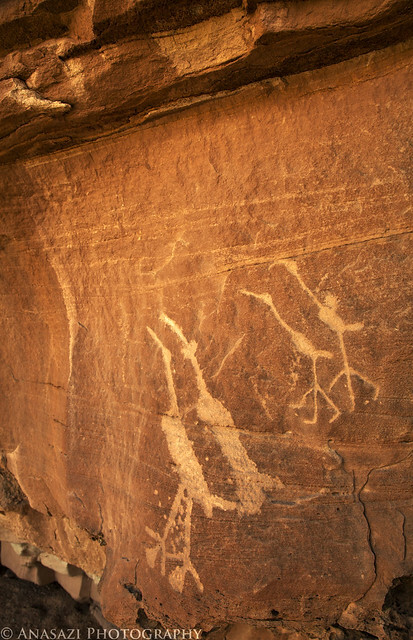 Even with my binoculars, I wasn’t sure if they were petroglyphs or not, but I finally convinced myself to make the climb and check it out. 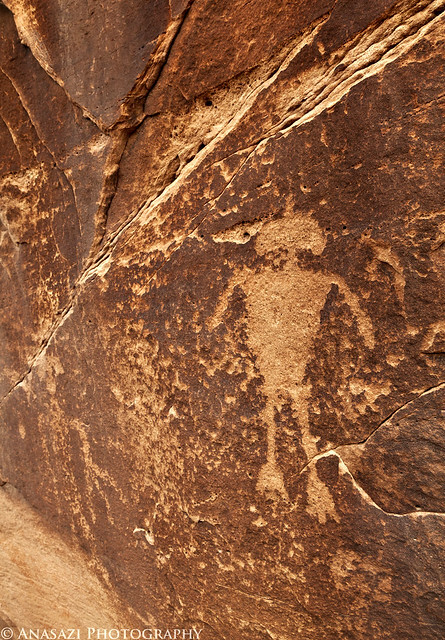 As you can see, they were petroglyphs! 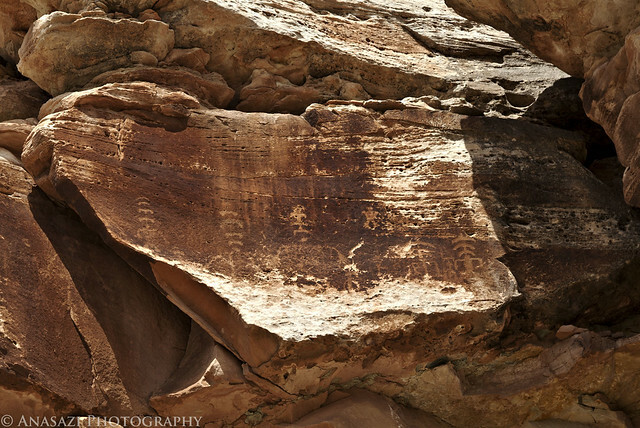 I walked the ledge in search of more, but only found a few very faint petroglyphs that I couldn’t really make out. Another small granary near the road. 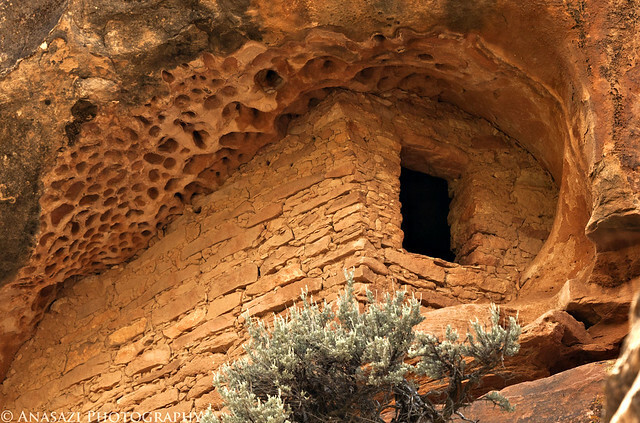 A cool granary known as the Honeycomb Granary. Next time I need to climb up to it for a different perspective. 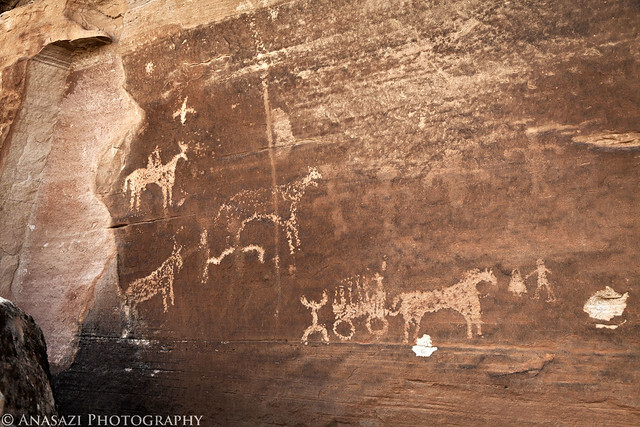 This petroglyph panel depicts a horse-drawn wagon and some other horses. 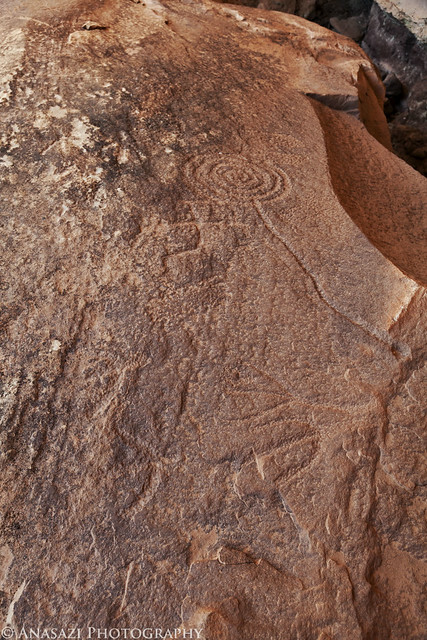 Another petroglyph I almost missed because I couldn’t tell if it was actually one. 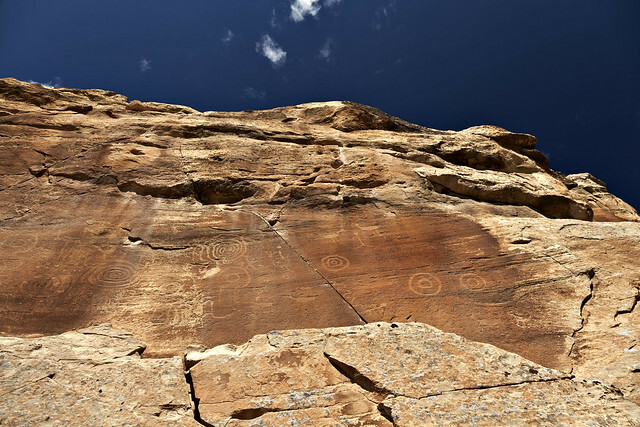 Luckily I made the hike up to this one, since there were some other glyphs in the area, a few small ruins and plenty of large potsherds. 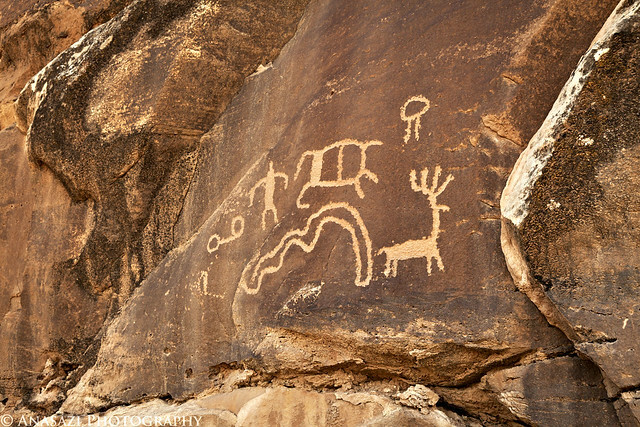 A few of the larger petroglyphs I found at the site mentioned above. This one seems to be missing it’s lower half. 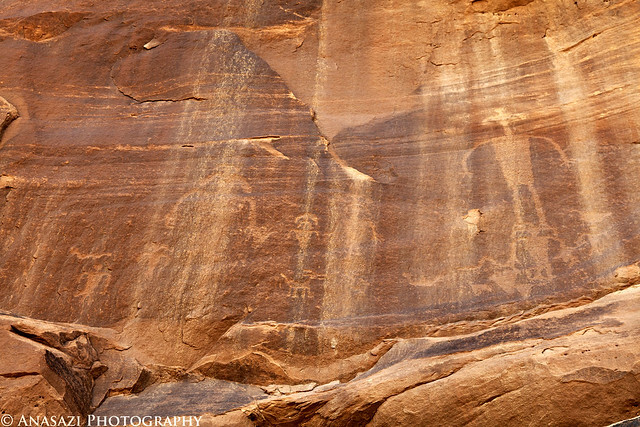 These anthropomorphs are wearing headdresses similar to the figures on the Butler Wash Panel along the San Juan River. 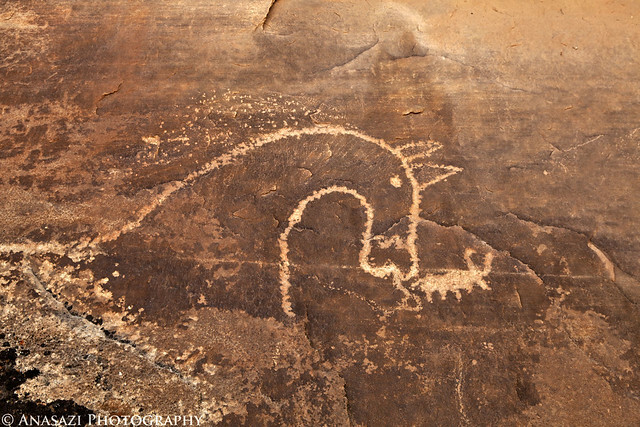 A large horse’s head petroglyph. 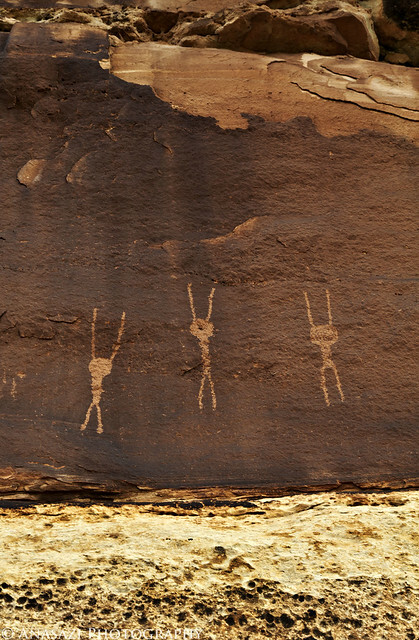 Looking up at some larger anthropomorphs. 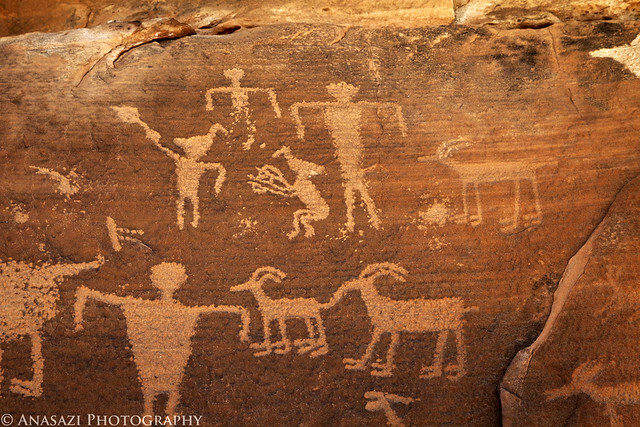 Here’s a very well defined panel with a small elk, an anthropomorph and a few other figures. One of my favorite panels that I visited this day. I was tipped off to it’s location by a friend. 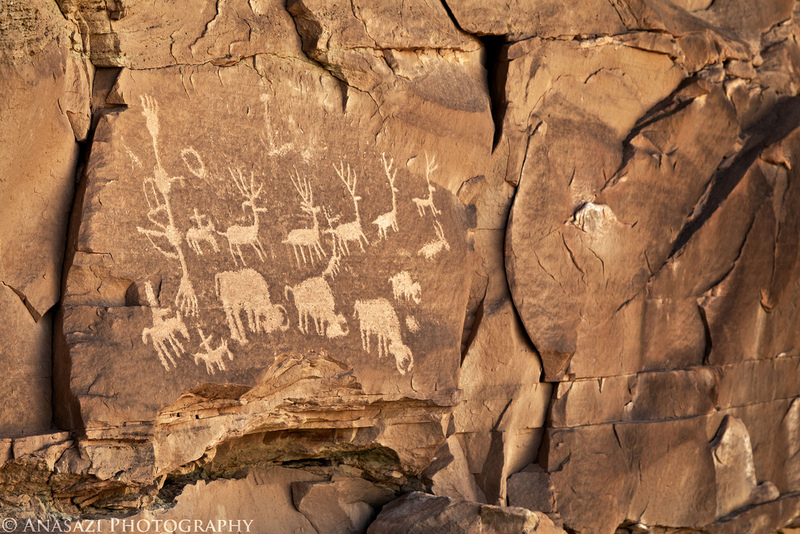 A big petroglyph panel containing some riders on horseback, a few elk and what looks like a couple of buffalo. After I finished up searching for rock art and ruins in Montezuma Canyon, I made my way towards Hovenweep to find a campsite for the night. These are beautiful, but wouldn’t it be nice if we had some coordinates and directions. We are headed that way tomorrow, hoping we can find a few.